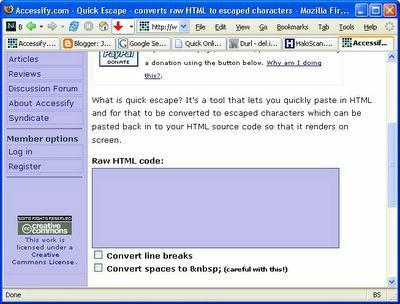 If you're like me and paste a lot of code into your blog, you might find QuickEscape handy. This is a handy website that lets you paste in some text, and convert it into HTML-safe characters e.g. & becomes &amp;, < becomes &lt;, > becomes &gt;, etc. Caveat: It seems to have a bug (feature?) 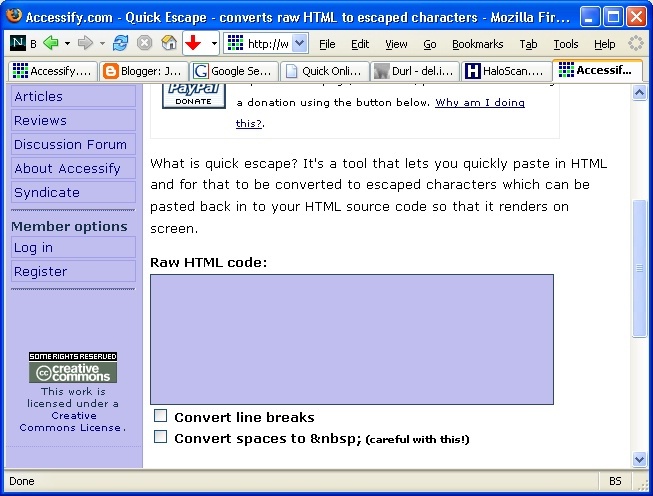 in which it also converts HTML-safe characters back to their original characters, so be careful with it. Update: If you use the XEmacs text editor, an even better solution is to use the HTMLize package. posted by Jonathan at 3/06/2005 09:19:00 p.m.